Blues, Beer, and Barbeque make life worth living! Yesterday, I finally figured out why my back has been hurting when I work at home. My chair is worn out! You’d think I’d notice something like that. Where I normally sit has worn away the padding. I’m not even sure how old the chair is, probably 5 years. It was a cheap one since I didn’t know what I wanted, but I needed one at the time. So I told Rich and Rick that a new chair could be one of my Christmas presents. Rich came back and asked why I need a chair if I wanted a standing desk. Good question! I did want a standing desk at home just like I use at work. Then I could really use a nice bar stool! A couple of years ago, my friend, Kim, gave me a tall chair and suggested that I elevate one table of my desk. She had done this before and loved it. She was parting with the chair since she was moving her desk and opted not to have it elevated. So Phil (Rich’s boss at the time) got a screwdriver from the staging area and came over to help me raise the first table to a height where I could stand and use the keyboard comfortably. I loved it. I could sit, stand, lean, and sit on the other part of the desk. I had a lot of options and my back didn’t hurt so bad. I’ve talked about raising my desk at home so that I could have the same freedom to move around and have options for sitting or standing. I have a lot of remodeling work to do in that room and thought I’d wait until I tore it apart to repair and paint. Since I need a new chair, it might be a good time to do something about the desk now. A bar stool might be cheaper than a desk chair. I could at least start out with one of the simple stools from around the pool table. This started the research phase of what is available out there in the way of a standing desk. OMG! You can spend a lot of money on some of these contraptions. 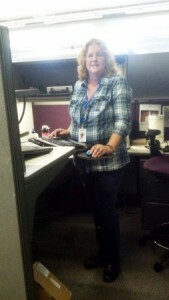 I started checking out some blog sites for what other people were doing to solve the standing desk issue. Some of them are a little crazy and some are just more than I want to do. I found a nice sturdy frame that I can attach my current tabletop to. It doesn’t look like a bad option. I’ll have to make my decision and get something to handle the issue. No more having to always sit when I want to work or browse Web pages from my computer. Oh yeah, and supposed you burn more calories standing as you work than sitting. I can see that, but it’s not really my motivation for this desk. Remember, my back hurts when I sit too much. Now for the Sascha news. So Rich and Sascha have been making good use of the Walky Dog attachment for the bike. Rich has taken her out a few times to run. She still afraid of the bike, but the chance to run always conquers her fears. Problem is, though, she still wants to be lead dog and she can’t do that from beside the bike. Sascha also wants to run at her top speed and not the sedate pace that the bike requires. I was hoping she would get used to it, but her instincts won’t let her. It was very, very windy the other day. Rich took Sascha out for a run as usual. On the return trip, Rich was pedaling into the wind and feeling a lot of drag. Sascha was trying to pull her weight and Rich’s weight while keeping up the same speed. She was so tired when she got back to the house. I felt so sorry for her. She did enjoy lolling around in the pool to cool down at the end. We made it through one week without another squirrel incident. It’s not that she isn’t trying. She almost had one on Thursday. Thank goodness he was just a tad faster than she was. I hope they are getter smarter about crossing her area of the yard. However, I still see a lot of flicking tails and hickory nuts being thrown. The squirrel population exists in safe numbers in the neighborhood at the moment. On Friday, the tree guy came by to give an estimate on taking out the trees in the way of new garage construction. It looks like 2 of them have to go. The third one might be salvageable since shag-bark hickory trees put down one large root and don’t spread out their roots like oak trees. We might not kill the smaller one by digging out there. Then there was the matter of the hickory tree at the back of the lot. All of the leaves have turned brown. We figure that the tree is dying. The tree guy added this one to his estimate. I really hate to take down the tree, but it would dangerous to let it go and fall down onto the road. We could always plant some nice trees in the area back there later on. Today, the weather was really cool. It is definitely the first day of Fall around here. Rich decided that it was cool enough to take Sascha out for her first scooter pull of this season. First, Rich needed to grease the wheels on the scooter. Sascha knew he had the scooter and was touching it. She was beside herself outside the garage door. There was whining, crying, and an occasional bark. Now Sascha on barks when she is frustrated. With maintenance complete, Rich put on his helmet, hooked up one very excited Siberian collie, and headed down the road with the breeze blowing. Sascha had trouble getting started. I think the word Hike was foreign to her. They got started and a squirrel ran across the road. Sascha started after him, but thought better after Rich shouted, “On by” a couple of times. They made it back without further incident. Sascha took a dip in the pool and then wanted inside. She stretched out in the living room and proceeded to sleep off the run. Good girl, Sascha. 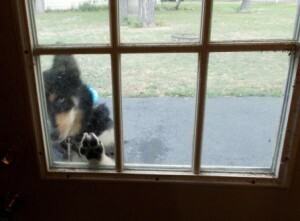 It’s not a wolf at the door. Sort of. It’s Sascha waiting to go scootering. She’s just so excited. At work, I have a standing desk. The keyboard and mouse are on an articulating tray so that it moves up and down as I need it. I love my standing desk at work! I truly believe in ergonomics for your work space. I remember my back/neck used to hurt a lot at work and I never considered it could be my desk/chair until one day the loss control guy came by to talk to me. He touched me on my upper back just below my neck and said “Does it hurt when I touch here?” Ouch! Yes it does. He told me my desk was set up completely wrong. After he fixed everything my body was so much happier. Amazing! Next Next post: End of September already? admin on An episode of “The Fugitive” being filmed in my neighborhood? Vanessa on An episode of “The Fugitive” being filmed in my neighborhood?